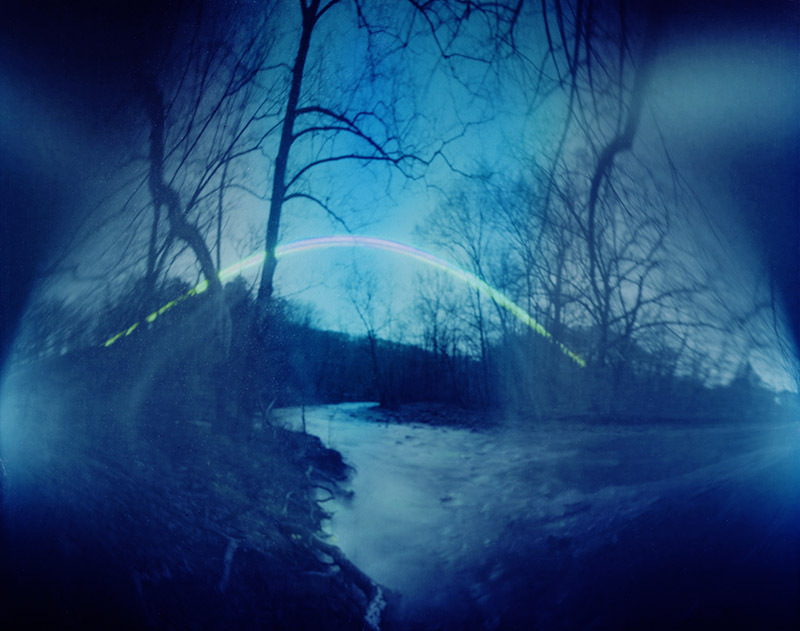 The winter solstice has come and gone - and so my Hunterdon Solargraphs project is more than halfway through its collection stage. Between August 2015 and today, I've placed a little under 450 cameras all over the county. Just more than fifty were either crushed on the spot or just weren't there when I came back for them. 175 cameras had usable negatives inside (including a few that had been crushed and left for dead,) and there are 220 cameras still out there that I hope to collect when the time comes. Basically, I am awash in solargraph images. And I'm still putting more cameras out - more slowly by now, but I'm still at it. I've posted a few of the images below. This represents a small but representative sample of the project so far. I did expand the parameters a bit, to include some shorter exposures in addition to the "equinox to solstice" duration I had originally imagined for all the cameras. In November I decided to experiment with shorter exposures and the results have sometimes been interesting - some of them are shown above. Even before the project is complete, I want to offer thanks to those who have indulged my attaching cameras on their property - including Hunterdon Art Museum, Custom Alloy Corporation, Harvest Cafe in High Bridge, the Union Forge Heritage Association, Factory Fuel Co. in Flemington, the Red Mill Museum Village, and numerous others who have showed good will to an odd endeavor.